PTE is Pearson Test of English. The reference here is to PTE (Academic Test), which is different from PTE (General), the latter being a suite of six tests at different levels (Al, 1, 2, 3, 4 and 5) designed to assess and accredit general English language proficiency. Both the test types are intended for test takers who are speakers of other languages (ESOL). Like IELTS and TOEFL, PTE (Academic) is designed to assess the English language skills of candidates who want to study in an English Speaking Country. However, PTE is different from IELTS and TOEFL in several important respects. First and foremost, unlike IELTS but like TOEFL, PTE is an online internet based test. More importantly, PTE is totally free of human intervention; it is a Computer-based Computer-assessed test. All the items in PTE (Academic) are machine scored. In a way, PTE is the new age language ability test that is free of any cultural or native skills bias. Other tests of similar nature involve human intervention at some stage where assessments can — knowingly or unknowingly — get influenced by external factors, such as, appearance, personality, body language, flow of thoughts, apart from cultural bias. Not so in the case of automated scoring system, where impartiality on all these counts is built-in and one can be sure to be judged only on language performance. An indirect but equally important benefit of the computer-based computer-assessed interface of PTE (Academic) is that the assessment is instantaneous and, at least theoretically, the result can be made available to the student immediately after the test. This is a far cry from tests like IELTS and TOEFL that typically take a fortnight to make the results available. Unlike IELTS and TOEFL that assess the test taker for communicative skills only (Listening, Speaking, Reading and Writing), PTE also assesses the test taker for enabling skills (Grammar, Oral Fluency, Pronunciation, Spelling, Vocabulary, Written Discourse). Apart from the composite score, PTE Academic rates the test taker separately on each of these parameters (4 + 6), to a scale of 10-90. The test takes approximately three hours to complete. This includes an un-timed introduction to the test and an optional scheduled break of up to 10 minutes. How is PTE (Academic) Different from IELTS and TOEFL? Part 1 of the PTE Academic test is Speaking and writing. This part tests your ability to produce spoken and written English in an academic environment. In this section, you are given a prompt and are asked to introduce yourself orally. You speak about yourself for up to 30 seconds. This is not assessed but is sent to institutions along with your score report. In this section, you are given a text (up to 60 words) and are asked to read the text aloud. You do six to seven of these items, depending on the combination of items in your test. In this section, you hear a sentence. You are asked to repeat the sentence exactly as you heard it. You do ten to twelve of these items, depending on the combination of items in your test. In this section, you are given an image (picture, graph, table, etc.). You are asked to describe in detail what the image is showing. You do six to seven of these items, depending on the combination of items in your test. In this section, you hear a lecture. You are asked to retell the lecture in your own words. You do three to four of these items, depending on the combination of items in your test. In this section, you are asked a question, the answer to which is a word or short phrase. You do ten to twelve of these items, depending on the combination of items in your test. In these sections, you read a text (up to 300 words). You are then asked to summarize the text in one sentence. You are given ten minutes to write each summary sentence. This section is either a Summarize written text task or a Write essay task (see Section 6), depending on the combination of items in your test. In this section, you are given a prompt to read. You are then asked to write an essay (200-300 words). You are given twenty minutes to write your essay. Part 2 of the PTE Academic test is Reading. This part tests your ability to understand written English in an academic environment. In this section, you read a text (up to 300 words). You are then given a multiple-choice question with three to five answer options. You choose the one correct answer option. You do two to three of these items, depending on the combination of items in your test. In this section, you read a text (up to 300 words). You are then given a multiple-choice question with five to seven answer options. You choose all the correct answer options. You do two to three of these items, depending on the combination of items in your test. In this section, you are given a text (up to 150 words) divided into paragraphs. The paragraphs are in the wrong order. You have to drag and drop the paragraphs into the correct order. You do two to three of these items, depending on the combination of items in your test. In this section, you read a text (up to 80 words) which has blanks in it. You drag words from a box and drop each word onto the correct blank to complete the text. You do four to five of these items, depending on the combination of items in your test. In this section, you read a text (up to 300 words) which has blanks in it. You click on each blank and a drop down list appears. You choose the correct word from each list to complete the text. You do five to six of these items, depending on the combination of items in your test. 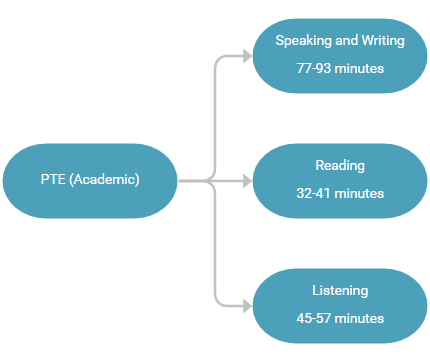 Part 3 of the PTE Academic test is listening. This part tests your ability to understand spoken English in an academic environment. It also tests your ability to understand a variety of accents, both native and non-native. In this section, you listen to a short lecture. You are then asked to write a summary of that lecture (50-70 words) for a fellow student who was not present at the lecture. You do two to three of these items, depending on the combination of items in your test. In this section, you listen to a recording on an academic subject. You are then given a multiplechoice question with five to seven answer options. You choose all the correct answer options. You do two to three of these items, depending on the combination of items in your test. In this section, you listen to a recording while you read a transcription of that recording. The transcription has up to seven blanks in it. As you listen, you type in the missing words you hear. You do two to three of these items, depending on the combination of items in your test. In this section, you listen to a recording. You read three to five paragraphs and select the paragraph which is the best summary of the recording. You do two to three of these items, depending on the combination of items in your test. In this section, you listen to a recording on an academic subject. You are then given a multiplechoice question with three to five answer options. You choose the one correct answer option. You do two to three of these items, depending on the combination of items in your test. In this section, you listen to a recording. The final word or group of words has been replaced by a beep. You are given three to five answer options. You choose the correct answer option to complete the recording. You do two to three of these items, depending on the combination of items in your test. In this section, you listen to a recording while you read a transcription of that recording. The transcription contains up to seven deliberate errors. You click on the words in the transcription which do not match the recording. You do two to three of these items, depending on the combination of items in your test. In this section, you hear a sentence. You are then asked to write the sentence exactly as you heard it, using correct spelling. You do three to four of these items, depending on the combination of items in your test. PTE (Academic) provides the taker composite or overall score as well as a separate score for each of the communicative and enabling skills. The composite score is based on the test taker’s performance on all test items (70–91 items of 20 different types). The score given for each item contributes to the overall score. The score range, for each parameter as well as overall, is 10–90 points. The communicative skills measured are listening, reading, speaking and writing. Items testing these communicative skills also test specific enabling skills. For items integrating various communicative skills, the score contributes to such different communicative skills are involved. The score range for each skill is 10 – 90. The enabling skills — grammar, oral fluency, pronunciation, spelling, vocabulary and written discourse — are tested in related assessment items in speaking and writing. The score range for each skill is 10 – 90 points. No enabling skills score is awarded if the response for the related item is inappropriate in content or form. An essay write-up unrelated to the topic assigned, for example, will earn no score, even for the related enabling skills. In relation to form, if a task requires a one-sentence summary of a text and the response consists of a list of words, no score points for the response will be given.